Book Direct and save on homes not available on other websites. 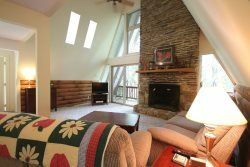 Residential Property Management & Sales LLC in Downtown Brevard, NC is a premier vacation rental home manager. Curated vacation homes to suit every taste and budget. Call the office direct with questions at 828-877-3434 x1. If downtown is where you want to be, check out the Artists Downtown Walkabout. Complete remodel with new central heat and air, well equipped with washer and dryer. Carport also. Downtown Brevard is the place to be for street festivals, night life and the food scene...dont forget the breweries! Check out our downtown offerings. Sherwood Forest is a unique and enchanting community near Brevard, North Carolina. As part of the Audubon Cooperative Sanctuary Program, our 1,000-acre mountain development is buffered almost entirely by protected woodland, including more than 20 miles of hiking trails with meandering streams and gentle waterfalls. Family Friendly rentals are just that, they have games, not too many steps, toys or video games, multiple TVs and good spaces for everyone to spread out and enjoy. The list of family friendly homes grows weekly, so check back often.